I have a new puppy/kitten when should it be vaccinated? Puppies and kittens receive infection fighting antibodies from their mother’s milk in the first hours after birth. This ‘maternal immunity’ is short lived, wearing off between six and 12 weeks of age. The first of a series of three vaccinations is given at eight weeks of age. For puppies this is normally a C3 vaccination providing protection against parvovirus, distemper and infectious hepatitis. For kittens, an F3 is given to prevent two cat flu viruses and fline panleukopaenia. In addition to this, kittens can start a Feline AIDS vaccine program. Both puppies and kittens have booster vaccinations at 12 and 16 weeks of age. This will keep them protected for another year. Puppies receive C5 vaccinations at this time which is the same as a C3 with the addition of Kennel cough. Contrary to popular belief, kennel cough can be contracted anywhere, not just boarding kennels. Kittens will either continue to get an F3 vaccination for the remaining boosters or they can be covered for Feline Leukaemia, Chlamydia and Feline AIDS. I cannot remember when my dog was last vaccinated. What should I do? All vets will keep a record of a patient’s vaccination history. If your pet is a new addition and you don’t know if or when they’ve been vaccinated, then it is best to assume that they haven’t been. If you know that your pet is overdue for their vaccination by more than three months then their antibody levels to vaccinated diseases could fall below protective levels. In both circumstances, we give two booster vaccinations one month apart. We routinely desex dogs and cats between five and six months of age. The RSPCA desexes animals at much younger ages to exclude any chance of any more unwanted litters. While desexing at a younger age is possible, it is associated with a greater anaesthetic risk. Desexing is recommended not only to prevent unwanted litters but also to protect your pet’s health. Female dogs are at a high risk of developing breast cancer, and uterine disease, the most severe of which is life threatening pyometra. Male dogs have increased risk of prostate disease, perineal hernias and tumours around their backside. Spray and mark its territory. In each of these cases desexing at a younger age will reduce each risk. Female dogs for instance, have a one in four chance of developing breast cancer if they are desexed later than two and a half years of age or left entire. If they are desexed before their first season at around six months of age, then the risk of developing breast cancer is negligible (less than half a percent), however even after just one season, their risk jumps to an astounding 8%! About half of breast cancers in dogs are malignant. It is hard to justify letting your dog have one season or one litter with these risks unless you are a registered breeder of dogs. Female cats are also commonly affected by breast cancer with desexing offering a similar protective effect. Unfortunately, breast in cats has a much higher chance of being malignant. Pyometra is an important condition of both female dogs and cats. It is a result of a massive life threatening infection in the uterus. Nearly one quarter of entire female dogs will be affected by pyometra by 10 years of age. Desexing will prevent your pet getting this disease. For male dogs, castration dramatically reduces the risk of developing, benign prostatic hyperplasia, prostatic cysts, prostatic abscesses and prostatitis. Many of these conditions are present at the same time in an affected patient and they can be difficult to accurately diagnose and treat. It is far better to prevent these conditions by castrating dogs at a young age. Perineal hernias are an unusual condition which is most commonly seen in entire male dogs. It is one of the most difficult types of hernia to fix and if left untreated can result in unrelenting constipation and bladder prolapse. Once again, this condition is far better to prevent by castrating early. How can I stop fleas and ticks from affecting my pet? Fleas affect both dogs and cats, sometimes causing severe rashes and skin infections. These parasites are very well adapted to our climate and they are notoriously difficult to get rid of. Fleas can emerge from their pupae in the ground or carpet within milliseconds of sensing warmth and vibrations in their surroundings from our unsuspecting pets. Fleas need to feed from our pets within hours of hatching in order to survive. Once they have, they can lay eggs in 24 hours. Fleas lay hundreds of eggs in their lifetime reinfecting your pet’s environment – your home! At any one time only 5% of the total flea population is on your pets and the remaining 95% are in the environment in various life cycle stages. This means that if you kill all the fleas on your pet today and you have had difficulty controlling fleas or you have not been treating your pets regularly with flea control, then they will most certainly be reinfested again tomorrow. I think my pet has a tick. What should I do? If you see a tick on your pet, you should remove it as soon as you can and keep it for your vet to identify. You can use tweezers, specially made tick removers, or if you’re not squeamish, your finger nails. Don’t be overly concerned if some of the tick’s head is left behind, it won’t inject any more tick toxin and if need be it can be removed at a later date. Read more in My Pet has a Tick. How often should I have my dog or cats teeth checked? 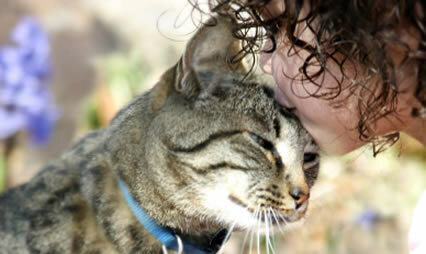 We will normally check your pet’s teeth when they come in for their annual vaccination. Common dental problems include plaque and tartar build up, gingivitis, periodontal disease, loose, worn and broken teeth. Most dogs and cats requiring dental procedures are middle aged (seven years old) or senior pets. These conditions generally relate to untreated accumulations of plaque and tartar which result in gingivitis and eventually to erosion of the support structures of the teeth otherwise known as periodontal disease. This does not mean that younger animals are immune from dental problems. Chewing on bones, rocks, sticks or sandy tennis balls can result in excessive wear or tooth fractures. Chronic skin allergies will also result in abnormal wear of the incisor teeth from persistent chewing. If your pet suffers any of these conditions then we may suggest checks every six months and more regular dental procedures. My dog has eaten Ratsak. What should I do? There are many rodenticides (Rat baits) on the market and all are toxic to our pets. The poison stops the blood being able to clot. Poisoning with rat bait will result in uncontrolled bleeding that can occur anywhere in the body. As such, clinical signs can vary. Without treatment, bleeding can be life threatening. If you catch your dog in the act of eating rat bait then notify us immediately and bring your dog into us. The sooner we induce vomiting to prevent absorption, the better. If it has been sometime since the rat bait has been ingested, then treatment is still possible. Poisoning may not result in clinical signs for a couple of days. We need to check for anaemia, clotting time and treat with vitamin K. It is always useful to bring the packet of rat bait in so we can double check which active ingredient it contains. What is the best way to medicate my dog or cat with a tablet? It can be challenging for some owners to medicate their pets with tablets. While more and more medications are being produced in easier to administer formulations, we still from time to time have no alternative but to use tablet medications. If you can’t properly give a tablet, this can result in treatment failure. We don’t recommend placing tablets into their food as this is also a common source of treatment failure. Here are some tips for tableting your dog or cat. The element of surprise can’t be underestimated when it comes to tableting. If you have had one or two attempts already, then each subsequent attempt is likely to be more difficult. If you are not used to giving tablets then you will need someone else to hold you pet. • If you are right handed then have someone hold your pet with their tail facing to your left and their head to your right. • With the tablet in your right hand, use your left hand to grasp the upper jaw with your thumb and index finger above the fangs. • Hold their head so their nose is pointing to the ceiling. This extends their neck and reduces the clamping strength of their lower jaw. • With the tablet held between the thumb and index finger of your right hand, use your middle or ring finger to open the lower jaw so you can push the tablet over the back of the tongue. This usually requires your fingers to get slimy, so don’t get squeamish or you’ll have to do it again with a slippery tablet. If you still have trouble you can purchase a pill popper. These hold the tablet for you and help you push the tablet further into their mouth. My neighbors are complaining about my dog barking. What should I do? This is a common source of neighborhood disputes and if your dog is an offender then unfortunately the responsibility is yours to resolve the problem. Barking is a natural behavior for dogs. They will bark if they perceive a threat, if they are excited or as part of play behavior. This type of barking is short lived. Nuisance barking as deemed by law is barking that interferes with the reasonable comfort, peace or privacy of anyone. If your dog is barking constantly or repetitively then it is important to ascertain why. There may be a stimulus such as noise, wildlife, activity of neighbors or passing pedestrians which trigger this behavior. Alternatively this can be an abnormal behavior resulting from stress associated with boredom, separation anxiety, apprehension or fear or as part of territorial behavior. Help is available if your dog is a nuisance barking offender. Any behavior modification strategy is going to require a little effort, time and persistence. You may also need to make some changes to the environment. This may be as simple as providing environmental enrichment with a variety of toys or treats hidden in Kongs® or frozen ice blocks can help keep bored dogs pre-occupied. A visual barrier may be needed to reduce stimulus from passing pedestrians if you have see through fencing. Deeper seated behavioral problems may require a trained animal behavioralist to visit your property, identify problems and cater a behavior modification strategy for you. Bark collars are available but should not be used as a sole method of managing nuisance barking. From an ethical standpoint, these collars must be used as part of a broader behavioral modification strategy. The debarking of dogs is not recommended and is done only as a last resort when all other measures have been taken to resolve the problem and a nuisance abatement notice has been issued by the council. We are happy to answer any questions you may have about nuisance barking. If we can’t help you, we will provide details of someone who can. What are suitable rewards/treats for my dog or cat? Providing rewards and treats to our pets is an important part of any training program, and let’s face it, sometimes we just want to spoil them. Like all things good, they are best given in moderation. Too many treats, or the wrong type of treat will just make you pet gain weight. You pet should only get treats for good behavior. Never use food as a form of bribery to stop your pet doing an undesirable behavior. You are effectively rewarding this behavior and your pet will associate this bad behavior as good behavior. Once your pet is showing progress with their training, rewards don’t necessarily have to be food. A toy, or giving affection such as patting should occasionally be used instead of food. What ever treat you give should be a low calorie treat. Table scraps, bacon rind, fat you’ve trimmed of some steak and human biscuits are far from ideal. Liver treats and beef jerky or often marketed as pet treats. These are fine, but remember they are a ‘sometimes food’. If you are giving a large number of treats during the day, these have to be included in their total calorie intake. This will generally mean they have to forego some of they normal meal. The amount of activity your dog needs, depends on their age, breed, activity level and whether they have any other health problems. Most dogs would benefit from daily exercise, however with many of us having busy lifestyles this is not always possible. Try to walk your dog at least three to four times a week. For fit, active breeds such as border collies, cattle dogs and kelpies daily walking is a must if they don’t have a large yard to run around in. Orthopaedic disease – This includes dogs with hip dysplasia, elbow dysplasia, cruciate ligament disease or any form of arthritis or spinal disease. These dogs have variable degrees of mobility problems. Be careful if you are planning on taking a long walk, they will overdo it if given the opportunity and they may either become very sore after they get home and cool down or they may actually collapse during the walk from pain or exhaustion. These dogs need exercise to maintain healthy joint function, but this has to be altered to suit their limitations. Keep it short and regular and make sure you aren’t to far from help if you need a lift. Other health problems including heart or respiratory disease and obesity will also necessitate and less intense exercise program. If on the other hand you can’t keep up with your dog, fetching games can help them burn off excess energy with little expenditure on your part. Frisbees and balls are popular for this. If you don’t have a great throwing arm, grab the tennis racquet or purchase a ball throwing aid like a Chuckit® ball launcher. Choose a large area with level surface, free of obstacles. Avoid situations where your dog has to change directions suddenly while chasing the ball as this predisposes to ligament injury. Sticks are not a safe throwing toy! These can become impaled in the back of their throat when they try to retrieve it while it is still moving. When should my puppy attend puppy pre-school? Puppies can attend puppy pre-school as long as they have had their first vaccination. We accept puppies up until 16 weeks of age. Puppy pre-school is designed to allow puppies to socialise with each other and begin essential obedience training during a critical stage in their development. This is as much an education program for owners as it is for your puppy, teaching you the ground work necessary for a well behaved and healthy dog. I have lost my pet. What should I do? If you have lost your pet, check the council pound in your area and phone our staff to report the details of your lost pet. In many cases, a pet with a collar, name tag and/or microchip will be happily reunited with its owners. I have found a lost animal. What should I do? If you find a pet without a collar, contact our staff to see if it has been reported lost. Further enquiries should be directed to the local council and/or the RSPCA.